My favorite month of the year is here, my friends. October. I swear it’s not because my birthday’s in this month. Wait…why don’t you believe me?? There’s something about the arrival of fall – the trees changing colors, the cooler weather. Hmmm…although neither one of those things really happens here in Austin. But in all seriousness, October is also National Breast Cancer Awareness Month. When I was in high school, my godmother was diagnosed with breast cancer, and her condition was pretty advanced. It was a difficult thing to witness as she had to undergo a double mastectomy as well as her treatments. I remember going to the wig shop with her and picking her up on a number of occasions from MD Anderson Cancer Center. At the time, I don’t think I fully grasped the ordeal that she was going through, but looking back on it now, I’m amazed at how she managed to stay so positive and cheerful through the entire process. I remember how she used to snag me an Otis Spunkmeyer Banana Nut Muffin on her treatment days. She didn’t have to…but she knew I liked them and she wanted to put a smile on my face. That’s the kind of woman that she was……and still is! Thanks to the grace of God and the wonderful medical team at MD Anderson, my godmother is cancer-free and enjoying life to the fullest even in her 70s! So when I found out that Rudy’s BBQ and Mighty Fine Burgers were both running promotions benefitting the National Breast Cancer Foundation, you know I had to show them some love. For those of you unfamiliar with Rudy’s, let me tell ya…definitely my favorite restaurant attached to a gas station ;). Although they first started in San Antonio and can now be found in Arizona, New Mexico, and Colorado, I truly believe the Austin stores are pumping out the best food in the brand. Yes, I might be a little biased, but I’m sure my fellow Austinites will agree. Actually, Rudy’s was just ranked as one of the top 20 BBQ restaurants in America by Huffington Post. 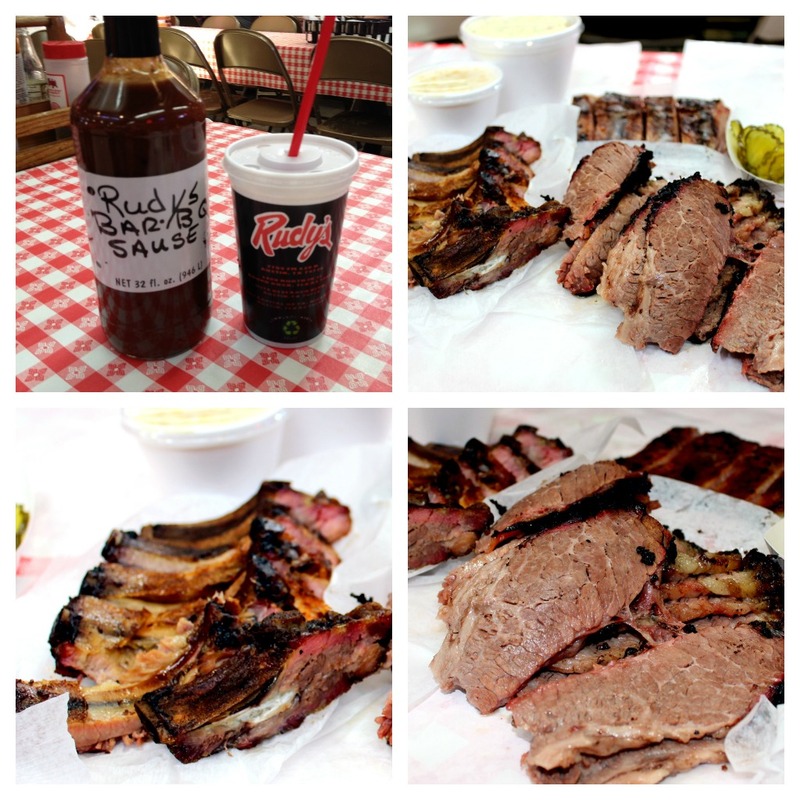 You really can’t go wrong with any of the food coming out of their 100% wood-fired pits, but the one thing that is a must is their extra moist brisket accompanied by some of their famous Sause. Look at the marbling on that brisket!! During the month of October, all of Rudy’s 32-oz. trophy cups will be pink, and if you choose to donate $1 to the National Breast Cancer Foundation, you’ll receive a coupon for a free drink on your next visit. In the famous words of Charlie Sheen…winning, anyone? You get a reusable cup in limited edition pink, you’re contributing money to a great cause, and you get a free drink at a restaurant you know you’re gonna go back to — winning. And as for Mighty Fine…milkshake anyone?? That’s right. 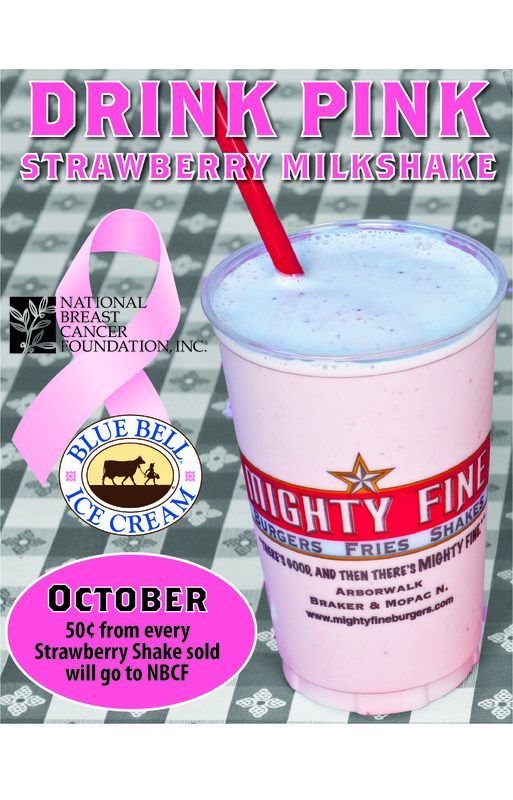 Buy a strawberry milkshake in the month of October and Mighty Fine will donate 50 cents to the National Breast Cancer Foundation. You all know of my affection for Mighty Fine. Ranked #37 in Texas Monthly’s “The 50 Greatest Hamburgers In Texas” back in 2009, Mighty Fine (especially the one in Round Rock) never seems to disappoint. Even when the line’s backed up to the door during Sunday lunch, their well-oiled crew continues to deliver quality service til every guest is served and satisfied. This past Saturday, I was tempted to order off their “Locals’ Menu” and try the Beast – two 1/2 lb patties, 4 slices of American cheese, “red & white” (ketchup and mayo), lettuce, tomato, onion and pickles. But after having visions of me suffering from the meat sweats and the impending meat coma, I came to my senses and ordered my usual 1/2 lb cheeseburger. However, rather than chomping down on their normal medium-well to well done patty, I ordered mine medium, a tip I learned at the last Dishcrawl Austin. For just an additional 8-10 minute wait, you can get even more succulent burger goodness…or at least, that’s what I anticipated. So how did my medium-cooked burger compare?? Honestly, I didn’t find it any different from their regular patty in terms of flavor. I did get a bit of extra juice, though. Okay…maybe a lot of extra juice. 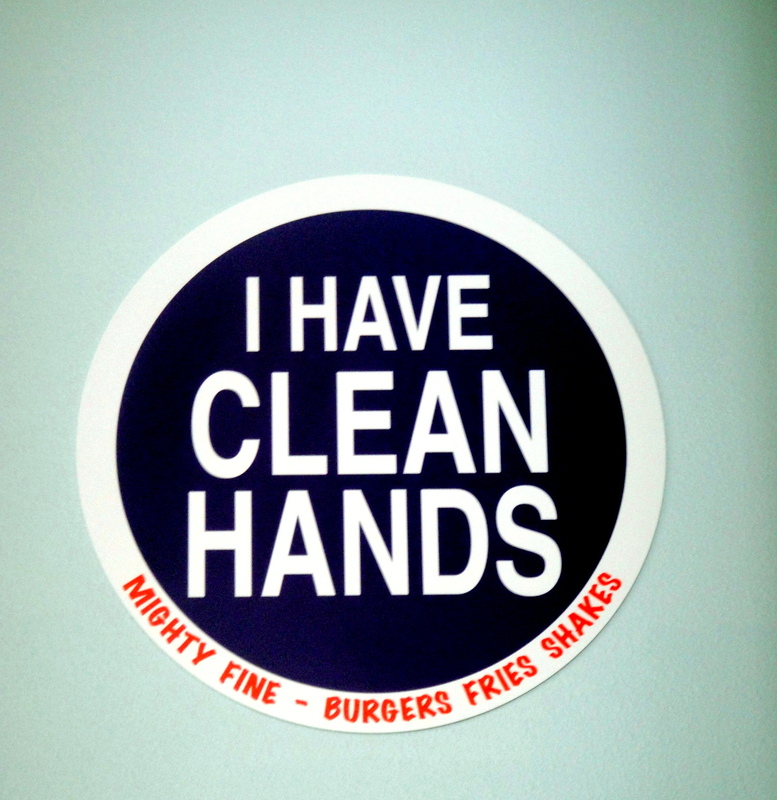 I probably emptied half the napkin dispenser in a feeble attempt to keep my hands clean. I now see the necessity of keeping the burger in its wrapper during consumption. That magical white paper keeps all the ingredients together and in between the buns where they should be. 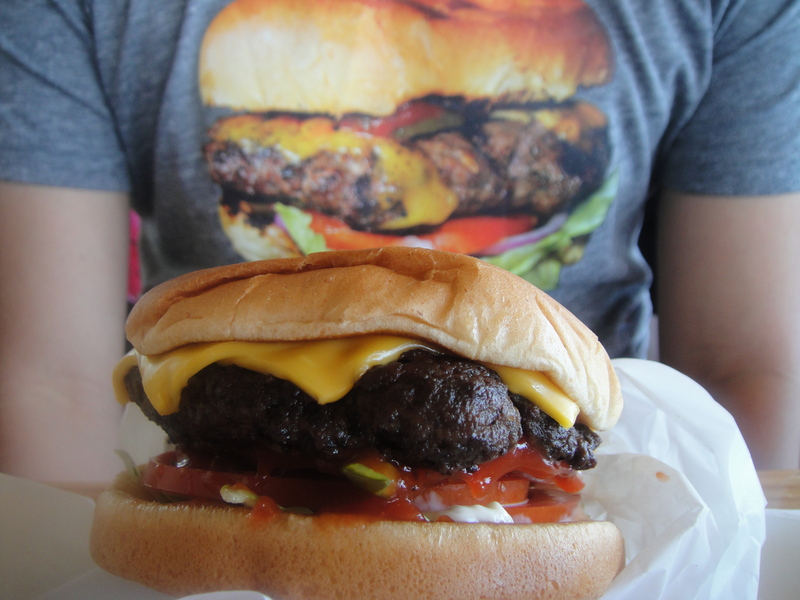 I don’t usually entirely unwrap my burger, but I did so on this occasion in hopes of getting some better shots. A special thanks to K&N Management for letting me tell you guys about their October promotions and for some of the behind-the-scenes pics!! 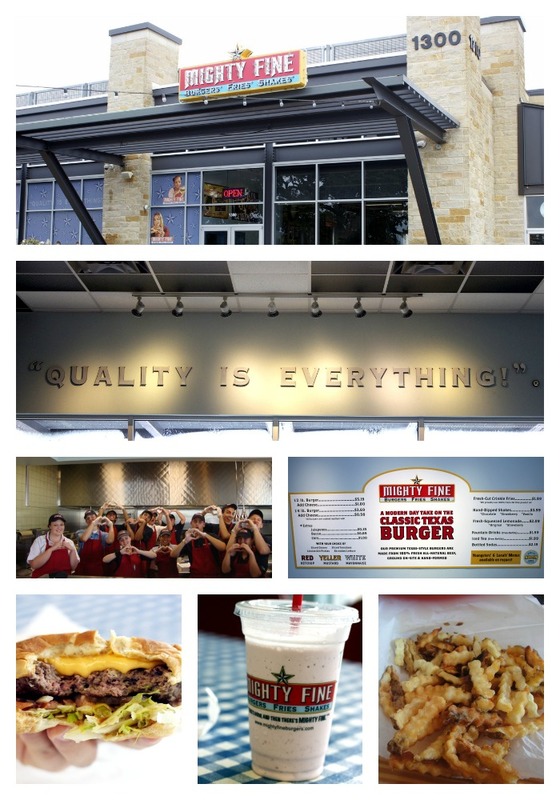 If you’re one of the lucky ones and live here in Austin or one of the surrounding towns, be sure to stop by a Mighty Fine near you and enjoy a strawberry milkshake with your burger! OR if you’ve got a Rudy’s close by, enjoy some extra moist brisket and some St. Louis ribs, and pitch in an extra dollar to help support a great cause.